November 25, 2010 - As airports brace for the busiest days of the year, two groups won’t be holding up the security lines pilots and flight attendants. Media outlets, including the Monitor, widely reported the pilots’ deal last week, but fewer have noted that flight attendants will receive the same treatment. Security officials acknowledged in a deal brokered on November 19 between unions and the TSA that the people who have unfettered access to the cockpit do not need to undergo invasive screening procedures as part of their daily commute. “It just doesn’t make sense we spend our resources doing this intensive security check on workers who are in a safety-sensitive position and who have been screened before they are allowed to get the job," says Patricia Friend, president of the Association of Flight Attendants. Passengers have also complained loudly about the invasive scans, which render a naked image, and the “enhanced pat-downs,” which require whole-hand rubbing against all parts of the body. 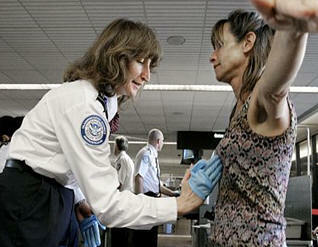 Most passengers fly infrequently, however, making checkpoint screenings a rare indignity. For those who go through checkpoints daily, the risks – and indignities – are larger. Pilots’ unions, concerned about the disproportionately high exposure to the scans’ radiation, urged their members not to walk through the Advanced Imaging Technology scanners, pointing out that there are no long-term studies looking at cumulative effects on pregnant women, those with compromised immune systems, and others. Pilots and flight attendants in uniform are still subject to security, but as of Friday, they get what everyone got until last month: a walk through a metal detector and, if that gets triggered, a quick secondary screening. The metal-detecting wands are gone for good, but the secondary scan for airplane crew will be the back-of-the-hands pat-down that passengers remember from before the new protocols went into place on November 1. In order to become a flight attendant, a man or woman – and it’s usually a woman, in this industry with more than five women on the job for each man – must be fingerprinted and receive a detailed 10-year background check. When it comes to security, one difference remains between pilots and flight attendants. The TSA has now agreed that pilots will get the biometric ID cards, which will let them pass through security even quicker, that Congress demanded two years ago for all flight crew. But TSA hasn’t mentioned when flight attendants should expect theirs.